How do I prepare for a mammography exam? Do not apply powder, creams, or deodorant on the day of the mammography. These items may contain substances that interfere with the accuracy of the x-rays. What happens during a mammography exam? The patient is asked to undress from the waist up and remove all jewelry in the area to be x-rayed. During the examination, a front opening gown may be worn. The patient will either sit or stand in front of the x-ray machine. The breasts are x-rayed one at a time. Plastic plates are used to flatten or compress the breast as much as possible. This flattening of the breasts allows maximum examination with a minimum radiation exposure. Does a mammogram cause discomfort? There may be some temporary discomfort when the breasts are compressed between the two plates. To minimize the discomfort, the exam should be scheduled for the week following a woman's menstrual period, when the breasts are their smallest and least tender. Any discomfort disappears as soon as the plates are removed. At Tolland Imaging, our trained technologists are specialized in mammography and look forward to easing your fears or concerns about your exam. The entire examination can be completed in 15 or 20 minutes. When will I get the results of my mammography? At Tolland Imaging, most mammogram results are conveyed to our patients or their physicians within 24 hours time. Some final exam results may take longer dependent on prior films reaching our office after the exam has taken place. Are there any complications from having a Mammogram? There are no known complications to this very simple procedure. As with all x-rays, it is imperative to keep radiation exposure at lowest levels as possible. Our technology at Tolland Imaging produces a reduced exposure than previous technology of the past. Radiation exposure is so small that it is not considered an important health hazard when weighed against the benefits of having the exam. 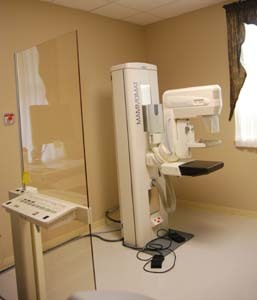 Mammography is a method of examining the breasts by using low-dose x-rays. This simple, painless procedure can detect tumors and cysts, often to small to be felt by a manual examination. It can help differentiate between harmless or benign tumors and cancer, although a definitive diagnosis requires a biopsy to study cells from the actual breast lump.